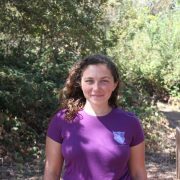 Alexandra Stefancich is a Community Education Specialist at Sierra Foothill Research and Extension Center (SFREC). Alexandra has been at SFREC for two years and in that time has developed all-new youth science-education programs that now serve over 1,500 local students a year. Run with the help of a team of dedicated volunteers, these programs give students a chance to get out in the field and do hands-on science. Ali loves being involved in environmental education because she loves young people and nature and hopes that her programs will help connect students to their local ecosystems and increase their understanding and enjoyment of science. She holds a Bachelor of Arts and Science with a concentration in Ecology from The Evergreen State College. Alexandra joined CUCSA because she feels passionately about helping to create a work place where everyone feels valued and empowered to reach their full potential.